With more than 20,000 gunite pools built by Blue Haven throughout North Texas, you can count on our Metroplex construction team to build your backyard dream—and build it right. 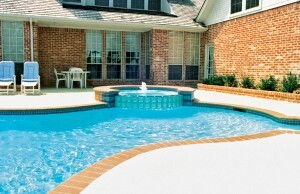 A quality pool contractor should be able to build whatever kind of custom pool you want. From a stately Roman-shaped pool with a tanning ledge to an organic free-form lagoon with natural rock waterfalls, Blue Haven can create an attractive, affordable outdoor retreat for escaping the Texas heat and enjoying healthy family fun. Along with providing superb local pool construction services, Blue Haven’s exclusive technology makes pool ownership more economical with automated and energy- and water-efficient features. Our complete array of equipment options ranges from saltwater chlorine sanitizers to high-efficiency heating systems that extend your swim season. Among the top picks by DFW pool buyers: color-changing LED lighting; energy-saving two-speed and variable-speed pumps with magnetic motors; and automated robotic, pressure, and suction pool cleaners. Another big Metroplex favorite is our SmartPure Duo—a purification powerhouse. This proprietary unit combines ultraviolet light with ozone generation to safely and gently provide fresh, sparkling pool water without the typical chlorine loads. With this amazing sanitizing system on your pool, you’ll never want to swim in traditionally chlorinated water again! 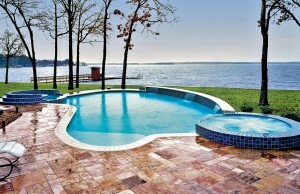 Many homeowners finance their new pool & spa in Dallas. And if you choose, Blue Haven’s offices in both Dallas and Fort Worth can help you do so as well (oac). Blue Haven loan specialists have helped match tens of thousands of inground pool buyers across the country with the right home improvement lender. With our national network of pool-loan funding programs, we are uniquely suited to help you obtain financing (oac) for a pool, spa, deck, and related backyard additions. Open seven days a week, our large, DFW pool design center features a working gunite pool and elevated spa. The display pool’s interior is finished with four examples of surface materials, allowing you to compare standard color quartz, premium color quartz, and pebble finishes. Our showroom provides additional finish choices to review. We also accept Visa and MasterCard for certain payment phases on your new pool. Our Metroplex display pool also boasts several water features, including a natural moss rock waterfall, natural flagstone scuppers (a kind of spouting spillway), sleek arched deck jets, and a cascade-style sheer descent. The display pool’s decking also illustrates some material types for surrounding your pool and creating a beautiful, functional patio area. Examples include natural rock, such as flagstone and travertine; concrete pavers; and decorative concrete options like colored coating, salt finish, stamped finish, and exposed aggregate. 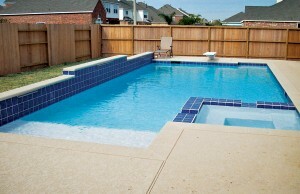 The dream of a owning a backyard pool has never been easier for Dallas-area homeowners who hire Blue Haven. As professional pool contractors, we lay the foundation for a great outcome by making the pool design process both informative and exciting. To do so, we use Pool Studio 3-D presentation software. It enables you to view the details of your new backyard oasis, providing a taste of the visual and auditory experiences of your new swimming pool. So call us to start planning your new aquatic resort. 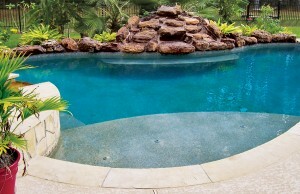 Our veteran team of Dallas-area pool designer provides no-obligation estimates in the comfort of your home. We serve the entire DFW Metroplex, including the counties of Dallas, Denton, Collin, Rockwall, Kaufman, Ellis, Navarro, Hunt, Fannin, Grayson, Van Zandt, and Rains. 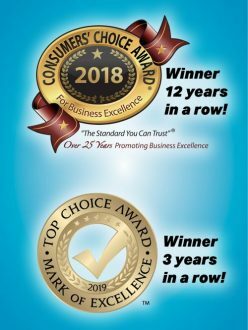 Our Dallas pool construction operation is a three-time winner of the Top Choice Award, a program that evaluates businesses in categories such as online reputation, customer service, and value of products and services. We are also an 12-time Consumers’ Choice Award winner. Recipients of this award are selected by third-party research results based on local consumer opinion about the business.